With moderators, you can delegate the responsibility of community management to others, such as your employees or trusted members within your community. Moderators have titles that you assign which designate their status in the community. Moderators encourage and stimulate member engagement through their own activity. They can post new topics and reply to topics posted by others. They can set the status of questions and ideas, as well as highlight the best content by pinning topics or featuring replies. Moderators also monitor community activity to ensure postings are appropriate and relevant. They have the ability to edit or remove any posting. They can also suspend and block member accounts. 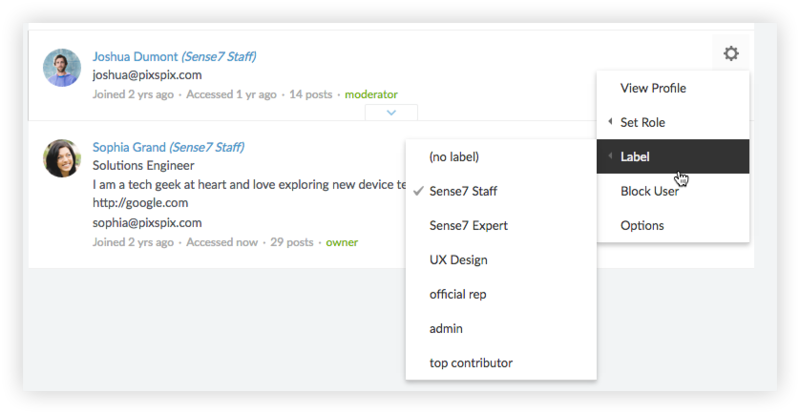 Administrators can do everything a moderator can do, but they have the added ability to configure community settings, such as adding categories or changing the theme, and the ability to add or remove moderators. The owner is the Forumbee account holder. The owner has all moderator and administrator privileges, and they have the added ability to manage the Forumbee account, including modifying payment information, changing the company name, and managing administrators. How do I add moderators? You can add moderators through an invite process or if the person is already a member you can set their role to moderator. Go to Users and click the Moderators tab. Enter the email addresses of the people to be invited as moderators. To send an email invitation, check the Send invitation option. Optionally you can edit the email subject line and message for the invite. The recipient will receive the email invitation with a link to join the community. After they have joined, they will appear in the Moderators list. At any time you can change the role of a user. In the Users or Moderators tabs, click the cog icon for a user. Member role: default role for community members. Users can post new topics, reply to topics, vote, and follow topics. Moderator role: Moderators can edit and remove postings, suspend or block users. Admin role: Administrators have all moderator capability and can also change community settings and manage moderators. 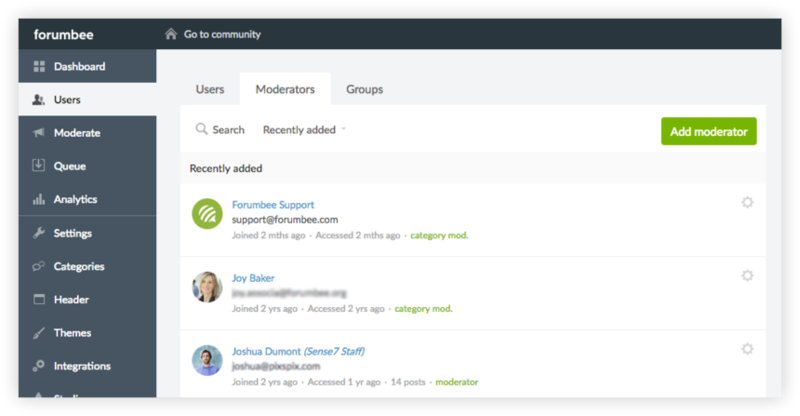 To convert a community member to a moderator, select the moderator role from this menu. To downgrade a moderator to a member, select the user role from this menu. In the Users or Moderators tabs, click the cog icon. Select Label and choose the label. You can also choose (no label) if you do not want a label to show. User labels are editable in Admin > Settings > User labels. Make your changes and click Save. 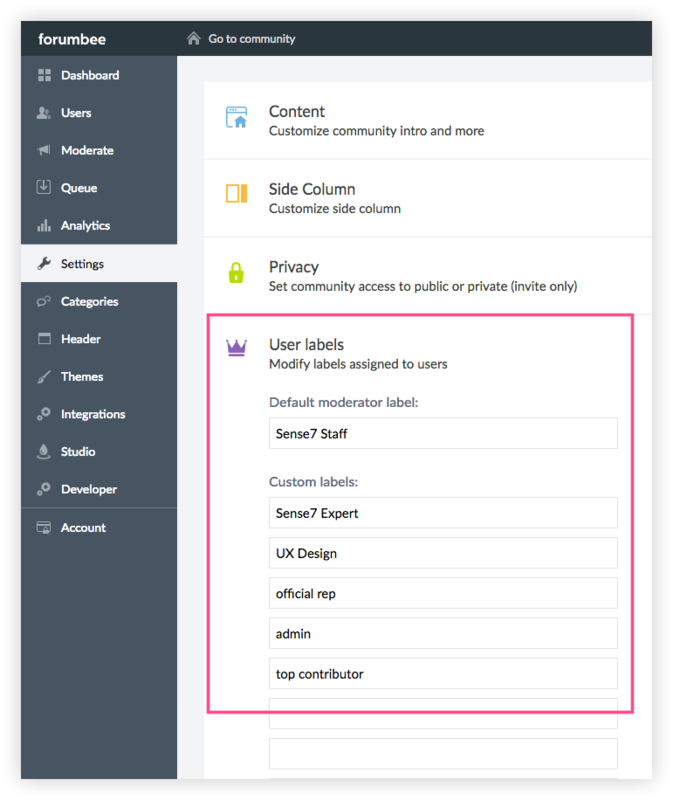 If you already have users assigned labels that you edited, their labels will be updated immediately with your changes.